North Carolina environmental officials said Tuesday that they are fining Duke Energy $25 million over pollution that has been seeping into groundwater for years from a pair of coal ash pits at a retired power plant. The state Department of Environment and Natural Resources called it the state’s largest penalty for environmental damages. It issued the fine over ongoing contamination at the L.V. Sutton Electric Plant outside Wilmington. The site includes a pair of unlined dumps estimated to hold 2.6 million tons of ash. The state touted the fine as an important development to hold Duke accountable for years of pollution. “Today’s enforcement action continues the aggressive approach this administration has taken on coal ash,” said Donald R. van der Vaart, the department’s secretary. But environmental groups said the fine doesn’t force Duke to clean up the pollution — something they’ve been trying to get the $50 billion Charlotte-based company to do for years. Without that, groundwater near Flemington, a largely working-class community, will remain contaminated, said Kemp Burdette, executive director of the nonprofit Cape Fear River Watch. “A $25 million fine doesn’t do anything to clean up the contamination caused by Duke’s coal ash ponds,” Burdette said. “They’re not forcing Duke to start treating groundwater, or start doing something to clean up the contamination. What they need to be doing is forcing them to clean it up. If they want to fine them, fine. The important thing here is getting the groundwater cleaned up,” he said. The company did not immediately respond to email or phone messages Tuesday. The state said monitoring wells near Duke’s dumps at Sutton showed readings exceeding state groundwater standards or boron, thallium, selenium, iron, manganese and other chemicals. Thallium was used for decades as the active ingredient in rat poison until it was banned because it is highly toxic. Duke’s 32 coal ash dumps scattered at 14 sites across the state have been under intense scrutiny since last year, when a pipe collapse at the company’s plant in Eden coated 70 miles of the Dan River in gray sludge. The ash, which is the waste left behind when coal is burned to generate electricity, contains toxic heavy metals. North Carolina lawmakers approved new legislation last year requiring Duke to dig up or cap all of its coal ash dumps by 2029. And federal prosecutors recently filed multiple criminal charges against Duke over years of illegal pollution leaking from coal ash dumps at five North Carolina power plants. The three U.S. Attorney’s Offices covering the state charged Duke with nine misdemeanor counts involving violations of the Clean Water Act. The prosecutors say the nation’s largest electricity company engaged in unlawful dumping at coal-fired power plants in Eden, Moncure, Asheville, Goldsboro and Mt. Holly. Duke has said that it has already negotiated a plea agreement under which it will admit guilt and pay $102 million in fines, restitution and community service. The company said the costs of the settlement will be borne by its shareholders, not passed on to its electricity customers. While Sutton was not one of the plants, state water quality officials knew for years about the contamination at the unlined ash pits but took no enforcement action until August 2013 — after the Southern Environmental Law Center, on the behalf of citizens group, tried to sue Duke for violating the Clean Water Act. “The easiest thing for Duke Energy is to write a check…But this proposed fine does not eliminate or clean up one ounce of coal ash pollution,” said Frank Holleman, senior attorney for the environmental legal group. Environmental groups said Duke Energy and state regulators are attempting to legalize potential toxic leaks from controversial coal ash ponds. New permits for three Charlotte area sites show Duke is requesting permission to allow multiple leaks to continue. Duke Energy’s coal ash disaster is well-documented. Last year, a failure at a coal ash pond near the Virginia border sent a toxic sludge of coal ash into the Dan River. Since then, Duke Energy has agreed to pay a $100 million fine to the federal Environmental Protection Agency. Yet in new wastewater permits filed with the North Carolina Department of Environment and Natural Resources, Duke Energy is asking that the very leaks that have gotten the company in trouble be allowed to continue. That’s causing major concerns among environmentalists. “Duke (Energy) is trying to paper over them and basically grant them an excuse,” Catawba Riverkeeper Sam Perkins said of three coal ash ponds around Charlotte. Permits request that discharges continue from “12 potentially contaminated groundwater seeps” near Mountain Island Lake, which supplies Charlotte’s drinking water. In addition, Duke Energy asked for permission to monitor levels of hazardous chemicals itself. Sara Benke, who lives near the Riverbend Plant on Mountain Island Lake, said she doesn’t trust Duke. This week, Duke Energy was fined $25 million by Department of Environment and Natural Resources for coal ash problems. Critics said the new permits should take that into account. “You would think that they might start to buckle down on those sites and actually try to get them to clear up their act,” Perkins said. 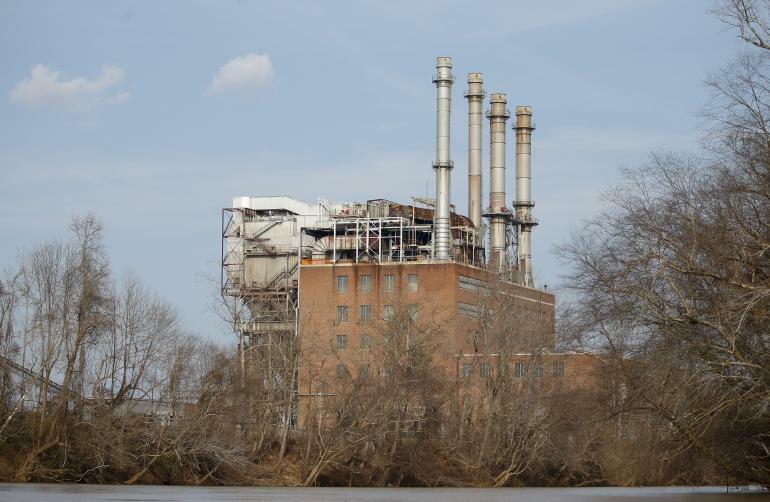 Duke Energy said in a statement that it needs the permits in order to quickly move ahead with its plans to remove coal ash from the ponds at Riverbend. Duke Energy has agreed to a plan to clean up all 14 coal ash ponds in North Carolina by 2029.